Letter to Asa Gray, 8 or 9 February 1860. In F. Burkhardt and S. Smith (eds. 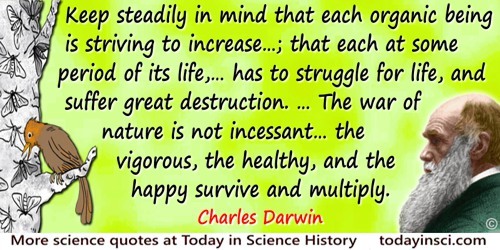 ), The Correspondence of Charles Darwin 1860 (1993), Vol. 8, 75. Letter to C. Lyell, 10 December 1859. In F. Burkhardt and S. Smith (eds. 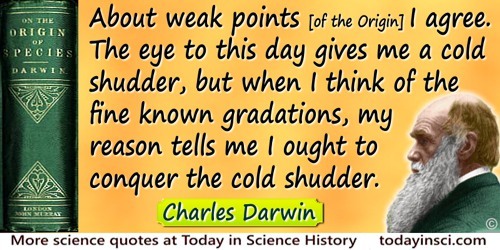 ), The Correspondence of Charles Darwin 1858-1859 (1991), Vol. 7, 423. I hope you have not murdered too completely your own and my child. 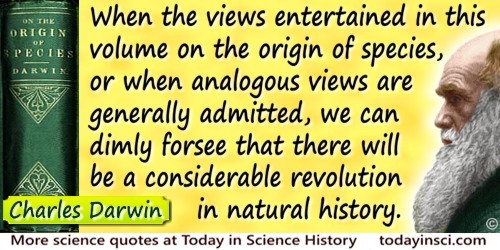 Referring to their independently conceived ideas on the origin of species. Letter to A. R. Wallace, March 1869. In J. Marchant, Alfred Russel Wallace: Letters and Reminiscences (1916), Vol. 1, 240. The origin of species is therefore simply the evolution of some difference—any difference at all—that prevents the production of fertile hybrids between populations under natural conditions. In 'Biodiversity Rising', The Diversity of Life (1992), 56. The Origin of Species (1859), Penguin edn , J. W. Burrow (ed.) (1968), 455.